Average Height	: 9" - 10"
Average Weight	: 8 - 10 lbs. Wag N Train Terrier Rescue’s mission is to rescue, rehabilitate, train, and rehome terriers. The Silky Terrier was created in the late 1800s by crossing the Yorkshire Terrier with the Australian Terrier. The goal was to improve the coat color of the blue-and-tan-colored Australian Terriers. The Australian Terrier and the Silky Terrier were the same breed for many years until they were eventually recognized as two different types and separated into two different breeds. During World War II, American servicemen brought some of these Silky Terriers home with them. The Silky Terrier has always been primarily a companion dog, but being a Terrier this little dog still loves to chase & catch rodents. The Australian Terrier emerged as a full-fledged breed around 1902--but emerged in two varieties, the Harsh or the Silky-Coated Australian Terrier. Over time, this multiplicity of coat types began to be considered the hallmark of two separate breeds of dog, rather than simply two variants of the same breed. So the Silky-Coated Australian Terriers began to be bred amongst themselves, resulting in the eventual emergence of the Silky Terrier as a breed in its own right by the mid-20th century. 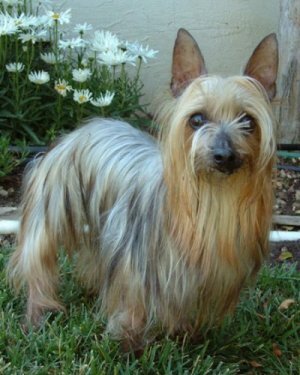 •	The Silky Terrier is very prone to tangles and mats and needs daily combing and brushing. •	Affectionate, spunky, cheerful and sociable. •	full of energy and needs lots of exercise to remain calm. •	Curious and keen this little tyke is an enthusiastic digger, so beware. •	A good watchdog ~ don't be fooled by their size. They are very alert to movement and noise. •	A good traveler if you want a small dog that travels well. •	Do not leave this dog with smaller pets like rabbits, hamsters and guinea pigs, and/or kittens. •	If allowed to be dominant this breed can become willful, protective and begin defensive barking. •	A healthy breed, they can develop diabetes, epilepsy later in life. The Silky Terrier--the dog that looks like a Yorkshire Terrier, is genetically closest to the Australian Terrier, and that has an energetic, curious, and temperamental personality all its own. The Silky Terrier isn't a dog for everyone by any means--but to those who are willing to go along with the Silky's sometimes difficult temperament and those who are willing to devote a great deal of time and attention to their Silky, the Silky's level of energy and loyalty can make it an ideal dog for a variety of purposes. The Silky Terrier physically resembles a Yorkshire Terrier in many respects. The two breeds share the same tuft of fur near their face, the same long, silky coat, and the same basic capability for hunting rodents and aggressively controlling their territory, driving out strangers and rival animals. However, the Silky Terrier also rises above some of its closest relatives in the Toy class of dogs by its authentically friendly and confident demeanor--although the Silky will bark at strangers, it won't compulsively bark even at people it knows well. Like many terriers, the Silky Terrier can be something of a handful if its owners don't know what they're doing. Terriers are almost without exception highly intelligent, highly willful, and highly energetic--which can lead, if the dogs are improperly handled, to all sorts of destructive mischief, problem barking, biting, or worse. That's the worst-case scenario. With the Silky Terrier, however, a best-case scenario is much more likely: a scenario in which you and your Silky can interact positively, channelling your dog's native energy into effective training, watchdog duties, or positive interactions with your children. This best-case scenario is helped along by the Silky's native friendliness and willingness to bond with human beings. This is best accomplished in the early years of a Silky's life, of course, but anyone who's willing to take the time to work with a Silky and show it the appropriate affection will reap the Silky's affection and loyalty in return. There are a few exceptions to this, of course: Silkies tend to dislike children who don't keep on their best behavior, and they especially dislike children who treat the Silky disrespectfully--meaning children who pull ears or tails, or who try to take away and keep away the Silky's toys or food. If you have children who can be reasoned with, consider yourself lucky--and consider getting a Silky Terrier for your family. If your children can't be reasoned with to behave appropriately toward a Silky, however, avoid the Silky Terrier as a family pet--they can easily become more trouble than they're worth. Like many long-haired dogs, Silky Terriers require a great deal of time and effort to properly groom. You'll want to spend at least a few hours every day brushing your Silky Terrier in order to keep its fur free of mats, tangles, and other issues that will cause health problems over time--and that will also keep your dog from looking his or her best as often as possible. It's also important to bathe the Silky Terrier on a fairly regular basis. Use a decent (yet inexpensive) dog shampoo and conditioner in order to avoid split ends, mats and tangles, and any other health problems near the root of your dog's hair. Since the Silky Terrier is a fairly small dog--and since it thus relies on its fur to keep it warm--you'll need to be extra careful to keep your Silky warm after a bath by wrapping it in blankets and keeping it away from cool, drafty areas. You'll also want to trim your Silky regularly in order to keep it presentable--as well as to help out your dog. Silkies have a great deal of fur on their face. In theory, this helps to protect their eyes--but in practice, it often just makes it hard for them to see where they're going. So it's a good idea to trim the hair close to the Silky's eyes into a neat V-shape in order to give them an easier time of it--and to trim some of the excess hair near the Silky's ears for the same reason. And don't forget to clip the Silky's nails whenever they get too long--though you'll want to be careful with this, as Silkies hate having their feet touched, and may react negatively to something that's entirely for their own good. Also, be advised: the Silky rarely sheds, but expect a slight volume of shedding at most twice a year. Regular grooming can alleviate this problem to some extent. Although Silkies don't need a lot of outdoor space for running and playing on a daily basis, you will want to walk them regularly in order to burn off some of their excess energy and get them out of the house for an hour or so a day. They'll be grateful for it--and you'll also be grateful to avoid destructive behavior on their part. When walking your Silky, you'll want to be careful about meeting other dogs or animals along the way. Silkies are often mistrustful of other animals, and might behave badly or even violently when encountering fellow dogs. Although this is certainly a good way to burn off energy, it's a problem behavior that neither you or your friends will appreciate--so make sure that your Silky is well trained to obey commands in order to alleviate some of these problems when they come up. Most of your Silky's exercise will probably come from indoors. Silkies are very good at playing with children (as long as the children respect their intelligence and don't treat them as a punching bag or a wind-up toy, of course), and a variety of fetching, chasing, or tug-of-war games can be used to keep your Silky active and friendly when the outdoors simply isn't an option. Silky Terriers, being terriers, are highly trainable--but being terriers, they're also highly resistant to certain forms of training. Abusive training is obviously not the best course of action, as is negative reinforcement (i.e. shouting at your dog or inducing "shame" responses for bad behavior). Surprisingly, repetitive training is also not the best option--while some breeds thrive on repeating and mastering complicated, puzzle-like behavior patterns, the Silky Terrier, being somewhat pushy and arrogant, will simply resent and resist your training efforts if they start to bore him or her. Despite all of these barriers to training, Silkies are quite trainable. What you'll want to do, then, is follow two general courses of action: start your training as early as possible, and make sure to vary your training routine in order to keep your Silky's interest. Starting your training as early as possible is a good idea simply because Silkies--like all dogs--tend to become more set in their ways as time goes on. Once a dog is set in his or her ways, then the dog's natural stubbornness becomes an opponent when you try to change any problematic behaviors that may have developed. The dog might have learned, for example, that the proper way to groom its nails and teeth is to scratch and chew furniture--and your efforts to teach the dog that it's only supposed to scratch and chew designated toys becomes a conflict between you and the dog, rather than a new idea for the dog to puzzle out and incorporate into his or her life. You won't be able to solve all obedience issues by starting training early, of course--but you can solve a great deal of them and save yourself some patience and effort for the others. For training Silkies into their adult years, it's a good idea to vary the daily training routine in order to combat the Silky's dislike of repetitive instructions. A good idea might be to break down the Silky's training into three or four distinct sections per day--general obedience, housebreaking, proper behavior toward humans, and tricks (or whatever categories you find the most useful for your particular Silky.) Switch between sections whenever your Silky starts to show signs of resisting training--whenever the Silky begins "acting out", wandering away, or even showing signs of "reverse training" (or acting in a manipulative way toward his trainer--or you.) And throughout the training process, remember to use a positive motivational system rather than a negative one--train by offering treats, praise, rewarding activities, or play, rather than by offering harsh language or unpleasant sensations (water bottle spraying or the like.) If you can keep the Silky's pride from kicking in--and if you can keep its active mind engaged through a variety of training exercises--you can go a long way toward curbing some of the energy and willfulness of the Silky Terrier.